Yoast is a search engine optimization plugin for WordPress. And it’s fantastic. Yoast gives you benchmarks and standardizations to help you develop content that will rank better on Google and other search engines. Yoast is widely considered to be the most complete SEO plugin available for WordPress. Stick around, and get some helpful tips on how to use Yoast SEO. First, install the plugin, if you haven’t already. There are many settings you’ll configure during installation, but we’ll focus on the typical use-case for the plugin: optimizing blog post content for search engines. It works wonders for general website pages, too. When you create a blog post, you’ll see a WordPress metabox containing post-specific settings for how you want the post to be represented and found on search engines. The first thing you’ll want to configure is your focus keyword. The focus keyword should be a three- to five-word phrase or concept that generally expresses the topic of the content. 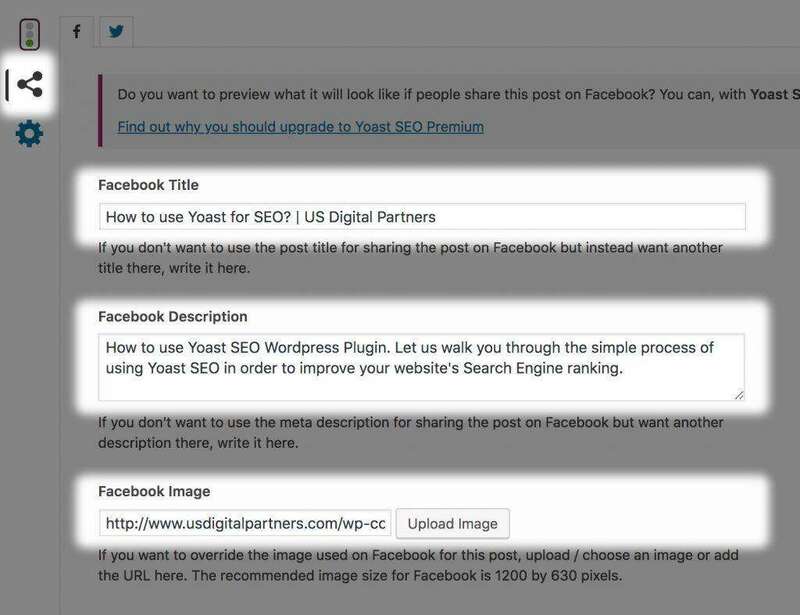 Identifying your focus keyword helps Yoast grade your post content using their own secret sauce. 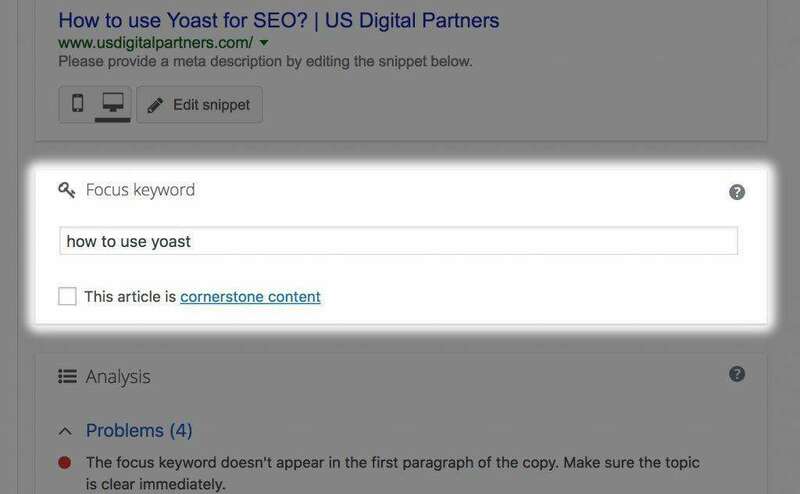 Now that Yoast has been configured to analyze your post content, you’ll want to consider the copy shown in a search engine result: The page title and brief description appearing beneath it. These can be configured using the SEO Title and Meta Description fields. Please note: For websites with numerous product pages, Yoast has variables that can be used to create page title templates. The Slug section lets you edit the page or post URL. Ideally, you should include the focus keyword in the URL. Please note: Whenever you change the url of a page, you will need to consider the effect this will have on incoming links to this page. The Social tab allows you to add tags to your pages and blog posts, which improve the way the social share dialog window looks. You can set the title, description, and image to lock in the messaging you want to share. Please note: We use the same page title and meta description with Google on the Facebook and Twitter views. 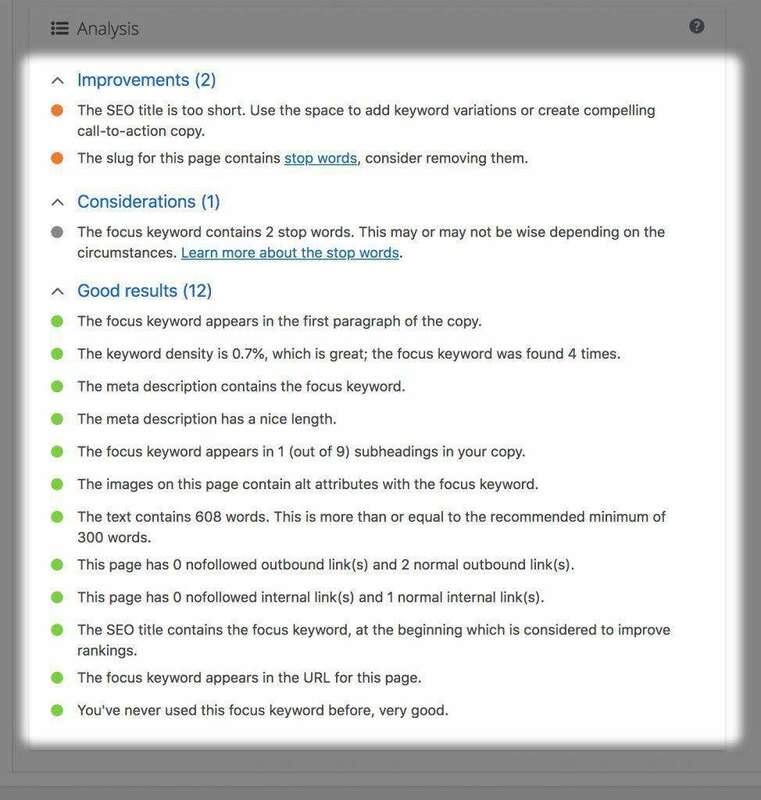 Yoast uses the Focus Keyword and other factors to produce an Analysis report for each page. Your goal is to get a green bullet for as many of the content checks in the Analysis section as possible (see below). Even though it’s best to do all the suggested improvements to your page, it’s not required to complete every single one. Use your best judgment to determine if the suggested change improves the post. 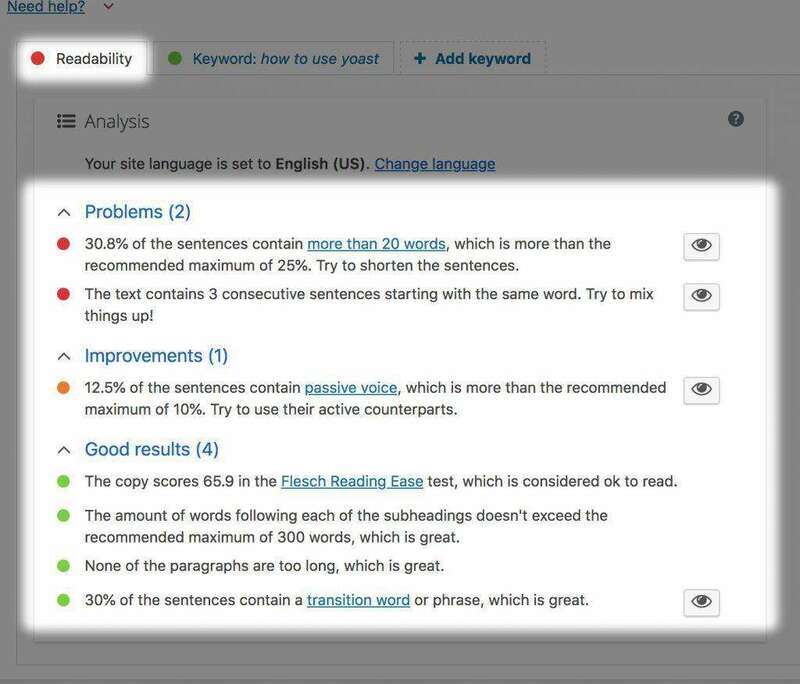 The Readability Report gives you an analysis of the content on the page. Spend some time on your content to make sure it flows nicely and is easy for a user to read. If you follow that advice from Yoast and make some tweaks to your content, you will see your readability score improve. 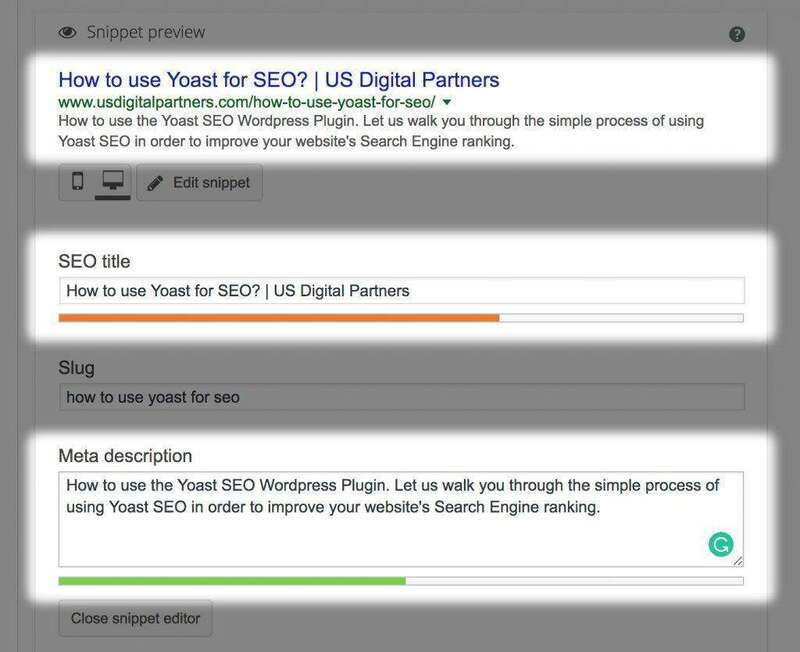 At US Digital Partners, we leverage Yoast to achieve SEO success on the websites we develop. There are many additional features we didn’t cover, including how to index your site with Google Search Console, add default page or post titles to numerous pages. The ability to control all of the SEO details on such a granular level, as well as the interactive feedback it provides, makes Yoast a super powerful interface to grow your search rankings. The best part? It’s simple! 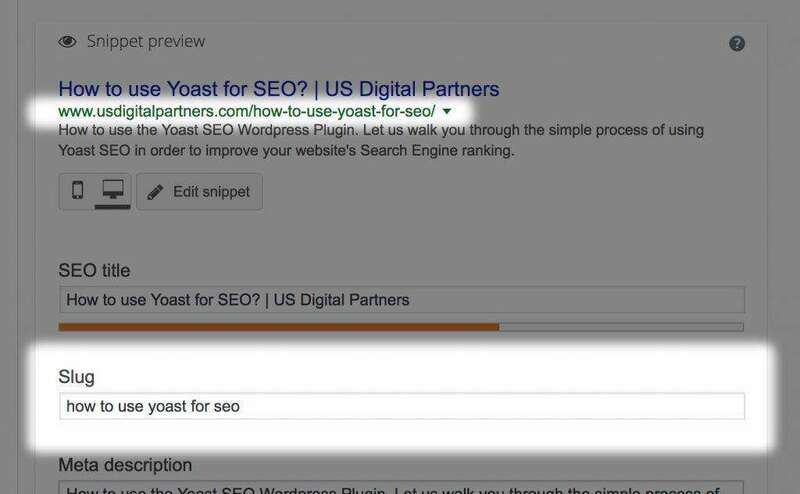 We hope you can see how easy it is, too, with this how to use Yoast SEO guide. Learn more about the powerful digital advertising and search engine optimization services we provide. To find out more about what is Yoast SEO and how to use Yoast, visit Yoast SEO’s site.